Margaret Cushing “Meg” Whitman (born August 4, 1956) is an American business executive. 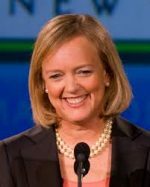 Whitman is currently the President and Chief Executive Officer of Hewlett Packard Enterprise, as well as the Chairwoman of HP Inc.
A native of Long Island, New York, Whitman is a graduate of Princeton University, New Jersey, and Harvard Business School, Massachusetts. Whitman served as an executive in The Walt Disney Company, where she was Vice President of Strategic Planning throughout the 1980s. In the 1990s, Whitman served as an executive for DreamWorks, Procter & Gamble, and Hasbro. Whitman served as President and Chief Executive Officer of eBay, from 1998 to 2008. During Whitman’s 10 years with the company, she oversaw its expansion from 30 employees and $4 million in annual revenue, to more than 15,000 employees and $8 billion in annual revenue. In 2014, Whitman was named 20th in Forbes List of the 100 Most Powerful Women in the World. In 2008, Whitman was cited by The New York Times as among the women most likely to become the first female President of the United States.In February 2009, Whitman announced her candidacy for Governor of California, becoming the third woman in a 20-year period to run for the office. Whitman won the Republican primary in June 2010. The fourth wealthiest woman in the state of California with a net worth of $1.3 billion in 2010, she spent more of her own money on the race than any other political candidate spent on a single election in American history,spending $144 million total of her own fortune and $178.5 million, including donors.Whitman was defeated by Jerry Brown in the 2010 California gubernatorial election. Whitman was a supporter of former Massachusetts Governor Mitt Romney’s presidential campaign in 2008 and was on his national finance team.She was also listed as finance co-chair of Romney’s exploratory committee.After Romney stepped out of the race and endorsed John McCain, Whitman joined McCain’s presidential campaign as a national co-chair.McCain mentioned Whitman as a possible Secretary of the Treasury during the second presidential debate in 2008.However, McCain lost the 2008 general election to Barack Obama. While running for governor, Whitman emphasized three major areas: job creation, reduced state government spending, and reform of the state’s K-12 educational system. She argued that it is best to start only a few things and finish them, instead of starting a lot of things and finishing few of them. During the 2012 Republican primaries, Whitman endorsed Mitt Romney,who praised Whitman.Whitman’s name had been mentioned as a possible cabinet member in a Romney administration.However, Romney lost the 2012 general election to Barack Obama. During the 2016 Republican primaries, Whitman was finance co-chair of Chris Christie’s presidential campaign. After Christie withdrew from the race and subsequently endorsed the Republican frontrunner, Donald Trump, Whitman criticized Christie’s endorsement as “an astonishing display of political opportunism” and called on other Christie donors to reject Trump.